that given the above, the requested report would involve a costly exercise that management can’t see the point of. This scenario happened at the last (12/6/2012) Council Meeting. Cr. Tang’s request for a report on planning permit extensions (12 June, 2012 Council Meeting Minutes – Section 9.9) resulted in a 4 page report which, although more “sensitively” or “politically” worded than GERA’s above basic interpretation, very neatly fitted the above scenario. Such a response would be both unthinkable and unacceptable response in a company – it is even more so when it involves a unanimous request from elected officials to an administration that is accountable to those elected officials. Cr. Tang commenced the ensuing discussion by commenting that when the initial public question was asked he thought it was a valid question and that it was surprising to know that the statistics were not available in Council’s planning database. He further commented that while Council keeps a number of statistics for statutory and operational reporting requirements, Council does not know if permit extensions are granted 5% or 95% of the time and also does not know how many extended permits exist with the municipality. Without this information Cr. Tang said Council is unable to assess whether or not an issue exists. Cr. Hyams – commented that he didn’t “see why you would go out there and get a planning permit if you don’t intend to use it” and collecting this data would be giving Council officers more work. Cr. Tang’s closing comments were that he did not believe that the request was a large request, that the information may be useful to present to the State Government when it assesses planning reforms. Cr. Tang’s final comment was “we don’t know what we don’t know”. The motion was put to the vote and carried. (Although a division was not called for the gallery noted that Crs Pilling, Lipshutz, and Hyams voted against the motion). Not one Councillor asked why the administration had not presented the information unanimously requested and had instead produced a document arguing against collecting the information. From the original request, the motion passed at this meeting was now to “commence” the collection of statistics on planning permit extensions – inherently this involves a four year wait for statistics. GERA agrees with Cr. Tang in that the request is not a large one. As per the State Government report on planning permit approvals included in the presented report, Council approves approximately 400 dwelling construction permits per annum. Details on planning permits are computerised, therefore, it should not be large task to access and analyse the data from 4-5 years ago. Why wait 4 years to identify a potential issue? Kingston Council did this analysis found that 60% of approved planning permits were given “rubber stamped” extension periods – no consideration was being given to what had been happening with applications for nearby residences since the original permit application. It is reasonable to assume that Glen Eira will find a similar percentage. The media has widely reported that developers “landbank” (for future developments) or enhance the value of their property by obtaining a planning permit. Additionally, a simple drive around the municipality provides the empirical evidence (which residents are well aware of) that this is occurring in Glen Eira at an increasing rate (no. of demolished or unoccupied homes that are fenced off or partially complete boarded up developments). That Council (Councillors and Administrators) have adopted the attitude of unwilling to investigate, “extra workload” and “not much we can do with it” is yet another example of gap between Council’s words and actions. Council’s claims that it “gathers the relevant information and, based on that information, makes the best decision possible” . GERA asks what is wrong with doing the analysis now? (it’s not a big ask), why the reluctance and why the wait? construction has not been completed within a 4 year period? “That a report be prepared for an Ordinary Council Meeting providing alternatives for the reporting of or referring to Council in relation to extensions granted or requested on issued planning permits in Glen Eira. 2. Notes the statistics that the planning department currently keep. (a) numbers of requests for extension. (b) numbers of requests for extension granted. (c) the average length for each extension granted. (d) whether the extension has been granted by VCAT or by Council. No division was called for, however, the gallery noted that Crs Lipshhutz, Hyams, and Pilling voted against the motion. Council promised that Glen Eira was to be Green, Gracious, and Gregarious. This photo shows the reality – Rosstown Road, Carnegie. No adverse parking or traffic impact? Planning Minister Guy has introduced into Parliament the Planning and Environment Amendment (VicSmart Planning Assessment) Bill 2012. Denial of third party notification and appeal rights is patently undemocratic. The majority of appeals now clogging up the system are not from resident objectors but from developers seeking to overturn or correct Council draft permits. Furthermore, resident appeals have a provable benefit – VCAT statistics show that the majority result in extra conditions (ie, better planning outcomes) and some proposals are refused altogether as being unsuitable (which is what planning is supposed to be all about). Consequently, resident oversight is vital to maintaining a curb on non-compliant proposals and helping ensure that council decisions are more consistent and more accurate (which is often not the case, as borne out by the VAGO report of Mar 08). However, while we are strongly in favour of third party rights, it is also obviously unjust and inefficient that such an important area of law and business is reliant on random volunteer resident oversight to help improve the probity, consistency and appropriate outcomes of development applications. No other government sector works like this. Clearly, more mandatory controls based on existing democratically-derived planning regulations is the simplest, quickest and best way to minimise delays and costs for all applications, as well as eliminate ambit claims and guarantee better and more appropriate outcomes. Mandatory controls would automatically mean far fewer appeals (so less delay and cost), but the appeal avenue should remain open to both applicants and residents to deal with the few cases where due process was not properly followed by Council or where the decision was based on incorrect or incomplete information in the application. Existing loopholes are already exploited by unscrupulous developers (it’s always the minority who seek to subvert the law that laws have to be made for). So it’s patently obvious that to rely on a naïve assumption that developers will provide accurate and complete information, to prevent councils from requiring further information, and to then have applications assessed by non-planners, will create a giant loophole begging to be abused – to the detriment of neighbouring residents. Finally, VicSmart is supposed to apply only to minor proposals. This will have very little effect on the efficiency of overall council assessments because simple cases are already assessed quite quickly once planners deal with prior complex applications in the queue. But the push to introduce these changes now would legitimise a process that with minimal further modification could deal later with more complex cases as well. Hence it is imperative that the Parliament resists these proposed changes. Contact your local MP to warn them that this legislation is a dangerous and unnecessary erosion of democratic rights which will reduce transparency and produce worse planning outcomes. It will also set a precedent for future legislation dealing with more complex planning applications such as apartment blocks. Last Wednesday’s (13/6/2012) Booran Road Reservoir Concept Plans Consultation gave residents the opportunity to confirm the views they expressed at the March, 2008 consultation (Friends of Glen Huntly Reservoir website – FOGHR) – this they did. The majority of the 50+ attendees preferred the passive recreation option over the active or mixed options. The Booran Road Reservoir (also known as the Glen Huntly Reservoir) is 1.6 ha of crown land located on the corner of Glen Huntly & Booran Roads, Glen Huntly. The site shares a rear boundary with Alamar Ave and abuts nine properties along Roseberry Grove. The reservoir has not been used to store water since the 1970’s. The site was/is considered to be the last undeveloped piece of land in Glen Eira that can be reverted to publicly accessible open space. 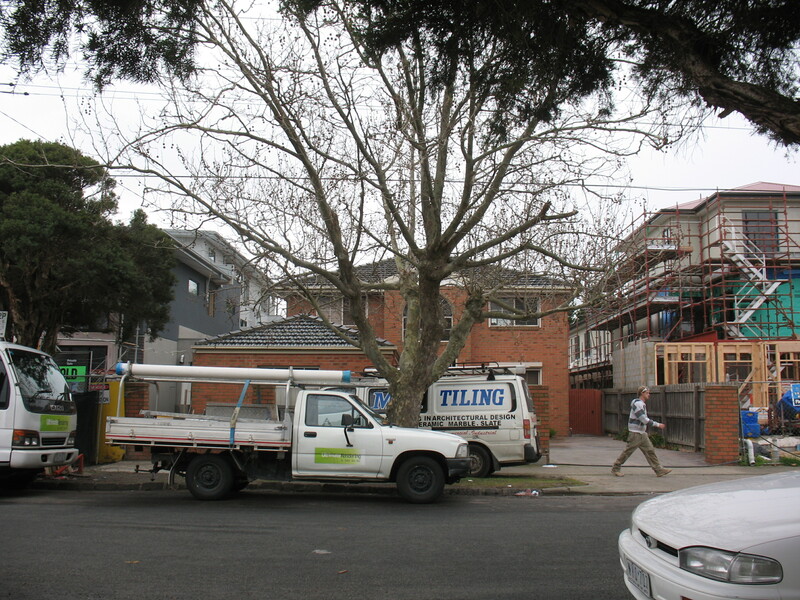 Around 2006/8, the site was declared surplus to South East Water use and in 2010 it was formally handed to Glen Eira Council by the State Government to manage* as publicly accessible open space. In March, 2008, given the impending State Government handover, a community consultation was held to discuss proposed uses. Council presented two options to residents: a) sell the land for development or b) convert the land to passive parkland with synthetic soccer pitch – residents overwhelmingly voted for passive parkland. As previously mentioned, last Wednesday’s (13/6/2012) consultation confirmed the 2008 preference for the former reservoir to become passive recreation open space. The plans presented were described, by the designer (Bill McLaughlin), as being “thoughts at the moment” and, although attendees were asked to indicate their preferred option (passive, active or mixed recreation) the consultation was not a forum to vote on the presented options – it was to gather attendees’ preferences so that they could be incorporated in future park plans. Paul Burke (Director of Community Services) explained that, while Council has budgeted for work to commence on the park in 2016/7, Council was commencing development of the plans well before this time so that the plans could be submitted should a government grant become available. Some 4 years on from the initial consultation (or 2 years on from Council securing management responsibility* of the site in 2010) Council is only now approaching the drawing board. In November 2009 Council estimated that it would take approximately 2 years to complete construction/landscaping and commissioning of the park**. A further 4 -5 years will pass before Council commences work on the park and that the work will take a further 2 years to complete. (Council Meeting Minutes 8th May 2008 – Strategic Resource Plan – 2017/18 budget is $4m, 2018/2019 budget is $3.5m). That Council (Councillors and Administration) considers that the spending of multi-millions on under-utilized, parkland consuming pavilions is a better use of ratepayers funds than creating parkland (1.6 hectares) in an area targeted for high density mixed use developments does not affirm Council’s claim of reflecting the needs and wishes of residents. What justification is there for leaving this “windfall” prime land a derelict, frequently vandalised, eyesore for the past 4 years and the next 4 – 5 years. * “manage” and “management responsibility” gives the land to Council to use and maintain for open space purposes yet retains State Government ownership of the land Council. Thus preventing a sale, originally proposed in 2008, of the land by Council. The project is currently in the feasibility phase. The Concept Phase will commence after Council has secured management responsibility over the land and determined how it would like to use it. Phases 2 to 5 are likely to take at least 2 years. Note: Management responsibility was secured in 2010. The following is a summary of comments made by those who attended last Wednesdays Consultation and are similar to those made at the March, 2008 consultation (Comments from FOGHR ). The community’s views have not changed. Council was aware of these views 4 years ago yet they failed to materialise in the draft design. Given council’s track record on consultation over design we are not optimistic that anything will be different this time! No car parking provision is included. The area has very limited on street parking and already demand exceeds supply. Multi use of area’s not taken advantage of – active sports areas could also be used for farmer’s market, outdoor theatre etc. All three options raise traffic and parking issues in an already congested area, however, the extent of the congestion varies with the use – including active sporting facilities will concentrate that congestion at specific times. Passive recreation will not concentrate congestion (more even flow of park usage). Trees currently surrounding the site need attention now. Tree maintenance undertaken now will generate a 5/6 year head start for the proposed park. Following on from our earlier posting of a Media Release from Save Our Suburbs (SoS) re proposed State Government planning changes, GERA draws residents attention to the latest SoS media release. Most of the rationale for the new VicSmart planning process doesn’t stack up, according to Save Our Suburbs president, Ian Wood. He strongly criticised the lack of community input into the new assessment criteria, council CEOs being responsible for permit decisions, the increased lack of accountability for developers, and the lack of appeal rights for residents. Mr Wood pointed out that the Minister promised when elected that councils and communities would have more say in planning decisions. But the new criteria are to be determined without community consultation. “VicSmart confirms this reality by allowing developer appeals to correct council decisions”, he said. Even worse for good planning outcomes is that VicSmart applicants will be trusted to provide the correct information upfront. Combine that with applications being exempt from further information requests by councils and you’ve got a recipe for disaster, according to Mr Wood. “Developers will be able to provide misleading information with impunity because councils will be powerless to demand further details”. “Already, unscrupulous developers often submit incorrect site context information which is often only detected by neighbouring objectors. Unauthorised changes are also commonly included on plans submitted for endorsement which council planners often don’t scrutinise closely. If undetected, these become part of the permit and are then legally difficult to correct by enforcement action”. “With VicSmart, this situation will be exacerbated so developers will be free to embellish their applications with impunity”, explained Mr Wood. “The decision-maker should never be deprived of the right to request more information. In the unlikely event of any unjustified or exaggerated requests, these could be challenged at VCAT, as happens now”. “On top of this, putting CEOs instead of planners in charge of application assessments will just maximise errors and poor decisions because permit decisions will be made by people who are likely to know nothing about planning”, he said. “VicSmart is a very dangerous thin end of the wedge for planning reform that removes yet further transparency and democracy from the system”, Mr Wood concluded. “SOS is in favour of planning reform but let’s not throw the baby out with the bath water. The simplest solution to improving certainty and reducing delays in planning permit assessments is to make most current planning controls mandatory. Appeal rights would be retained for both developers and residents but limited to disputes about the correctness and completeness of applications and whether council planners followed appropriate process”. The Community Plan represents the community’s views and aspirations for Glen Eira’s future growth and development over the next 4 years. As such, it provides the framework for the Council Plan/Strategic Resources plan which outlines how Council will allocate resources to meet the community’s aspirations expressed in the Community Plan. The Budget is a detailed allocation of resources for the first year of the Council Plan/Strategic Resources Plan. GERA has, therefore, focussed on the Community Plan, since it is the cornerstone for the subsequent Council Plan/Strategic Resources Plan and the Budget. Obviously, shortcomings in the cornerstone will flow on to the subsequent plans. In making this submission GERA has concentrated efforts on the four major interrelated issues raised by residents at the community forums. The stated strategic objective is “to promote the safe movement of pedestrian, bicycle and vehicle traffic by effectively managing and improving roads, footpath and bicycle lanes together with balancing car parking opportunities”. The first strategy is “improve safety and movement of road users and provide a fair and equitable balance of parking”. This is not a strategy and does not provide any meaningful information on what mechanism will be used to achieve the objective or how it can be monitored. What is missing in this strategy is the clear enunciation of the mechanisms that will be used to achieve the objective and which clearly establishes how the outcomes of the objective can be measured. Council proclaims that ‘safety’ of all road users is a priority. Yet, the Actions proposed do not address safety clearly enough. Far more is needed than the placing of a ‘speed trailer’ in a few streets or even 40 ‘community consultations’. What is required is the total integration of the Bicycle Plan, the Transport Plan and expenditure. The Action Plan does not achieve this integration and the suggested measures provide no quantifiable means of assessing whether ‘safety’ per se has been achieved. Thus it is impossible to determine how rates have been expended. Sadly, Glen Eira does not possess a separate ‘walking/pedestrian’ policy, even though its statements place pedestrians first. If our suburbs are to be made ‘safe’ for pedestrians, then there is nothing in the community plan which is geared towards ensuring this. Current international best practice is to manage roads via what is called a Road User Hierarchy. Basically, this ranks the most vulnerable road users (pedestrians and cyclists) as the number 1 priority with the last priority being a single occupant vehicle. Given Council’s long standing focus on main roads, rather than local streets, one can’t assume that Glen Eira, unlike other Councils eg. Stonnington and Port Phillip, has adopted this philosophy. Further these councils have implemented various road treatments which fully support such a strategy – ie. creating speed humps which are incorporated into footpaths to ensure safer pedestrian transition across roads. These councils also erect barriers on corners to protect pedestrians. Hence the vision of these councils is matched via practical strategies and funding. This is lacking in Glen Eira. Council makes the statement that “parking demand outstripped parking supply within Glen Eira many years ago”. Council introduced a Residential Parking Permit Scheme to address these issues, yet Council’s application of this scheme is ad hoc and random at best. Residents are continually faced with both medium and high rise developments on major roads which have been granted parking permits in the nearest adjacent local residential streets. These streets are already ill equipped to cater for the existing parking demand much less the increased burden imposed by developments. If Council is serious about addressing this problem then it must ensure that the Residential Parking Permit Scheme is applied rigorously across the entire municipality and that any development that will increase the number of dwellings per lot is excluded from this scheme. This is the most disappointing aspect of both the Community Plan and the budget. Residents have long made it clear that their concerns cover the entire municipality rather than only select neighbourhoods. They have also made it clear that they expect council to hold to its MSS to protect the social and environmental amenity of the entire municipality. The proposed strategies and measures do not come close to achieving any of this. As per the previous strategies and measures for the Traffic and Parking section, the proposals for the strategies in the Planning section are also deficient in that they fail to provide clear, measurable outcomes which will assist in achieving the strategic objectives. Primarily, the introduction to this “theme” relates to the significant benefits of open space (both for a community and individuals) and how little Glen Eira has (i.e. lowest amount of open space per capita of any Melbourne Municipality). This is in line with the issues residents have raised for many, many years and are issues which will continue to remain for many years as the number of high density developments explodes and subdivisions decrease the amount of private open space in minimal change areas. Glen Eira’s record in the acquisition of public open space is not commensurate with residents’ aspirations. In fact, over the years Glen Eira has probably sold more than it has acquired. What little open space remains is being further eroded via the ‘redevelopments’ of pavilion after pavilion which increases the buildings’ footprints, often necessitates expansions of car parks and access roads, and in the end, are probably under-utilised. Again, residents are never provided with data that would support the contention that such ‘developments’ are valuable ‘community hubs’ rather than a drain on limited resources. It it also worth making the point that Council includes such buildings as part of its capital assets (as are roads) but they remain non-realisable assets. Millions upon millions has been expended on such projects at the expense of basic infrastructure such as roads, traffic calming, drainage, and other essentials (which are also capital assets). Expenditure on most of these ‘essentials’ has in fact declined in recent years. Council claims to collect over $1 million dollars in open space levies. Yet this money is not employed in the purchase of further open space. Rather it is skewed towards more and more sporting grounds and facilities, instead of passive recreational use. The prime example of this is the failure to introduce community gardens which residents have raised for years and years. Even this budget and the potential use of the Booran Rd Reservoir ignores this possibility and offers designs which in large part are geared to more sporting ventures. The centre of the Racecourse ‘development’ is another case in point where Council has successfully minimised publicly available open space for Racecourse usage. It is indicative perhaps of Council’s attitude to the importance of open space as the foundation of planning, that its extant policy dates back to 1996. Nor does council have a public realm strategy which places the issues of open space as central to all planning activities and which was brought out clearly in the recent community consultations. In all of the strategies and measures included in the Community/Council Plan, open space is inextricably linked to ‘sporting facility upgrades’. This is a limited and deficient interpretation of what open space should entail and its importance to the community. How well are any of these standards incorporated into the community plan? And how well are the strategies that will achieve these outcomes enunciated? We believe that very few of these standards have been addressed in the draft Plan. For example, informing the community is not a substitute for real participation, consultation, or even transparency. Nor does it guarantee ‘efficiency’ and ‘inclusiveness’ – all of which are a continual source of frustration to residents. Most of the measures cited are either legal requirements, or simply confirm actions which are already in place. There is nothing innovative, or which addresses the issues of real consultation and participation. For example: agendas and minutes have been available on council’s website for years; as has the reporting function of Council’s quarterly reports. It would be far more useful if such reports were clear, accurate, comprehensive and informative. GERA would also like to make the comment that whilst the Community Plan notes many council policies such as the Asset Management Strategy, Open Space etc, many of these policies are not featured on council’s website. Many that do, are remain hopelessly out of date. It is most unfortunate that when council proclaims its adherence to various policies and how well they are working, that residents are denied access to these vital documents. All policies should be available and easily accessible. GERA is particularly concerned with these changes as the Glen Eira Planning Scheme has failed dismally to protect the social, environmental and economic amenity of the municipality. In stark contrast to the vast majority of councils, Glen Eira’s inadequate Planning Scheme** is ultimately working in favour of developers rather than residents. The combination of the State Government’s proposed changes and the inadequacies of the planning scheme will further skew the favour towards developers. Instead the committee mostly just recommends reviews, which the government’s response mostly agrees with, merely stating that the issue is noted or the process “is underway”. – No tightening up of enforcement to get rid of the inefficient dual process of Magistrates Court for punitive orders and VCAT for compliance. applications due to the excessive and inappropriate discretion currently exercised by councils (as borne out by criticisms of council permit assessments by the Auditor-General in May 2008). This is an unsustainable, unfair and inefficient situation. The only sensible solution is to limit the exercise of discretion and make policies more prescriptive to ensure that the appropriate quality, type and level of development is directed to where it is needed. Code Assess may be more prescriptive but it will also simplify controls and remove residents appeal rights – but not those of developers. That’s an admission that council decisions will still require oversight, so all parties still need the opportunity to be part of that process. Finally, there is a desperate need for a comprehensive community consultation process that could underpin a bi-partisan approach to a new state & metro planning strategy, as the Grattan Institute reported last year has been done successfully in many comparable overseas cities. Modern deliberative community consultation methods can be used to educate community, industry and government representatives to be able to produce an informed and democratic strategic plan for Melbourne that would also have the support of the community. But the online community consultation favoured by the Minister can’t achieve that goal because it involves no education and deliberation of participants and makes no commitment to taking on board their views. Instead, the further cuts to red tape suggested will just deregulate planning even further, rather than clarifying and tightening controls to produce more appropriate planning outcomes. * Save Our Suburbs Inc. (Vic) is a community planning group that lobbies for more accountable and transparent planning regulations to maintain residential amenity, provide effective transport solutions and encourage sustainable urban development in Victoria, particularly metro Melbourne.